HALIFAX BOSS Richard Marshall has warned Super League Widnes Vikings there is no chance his side will “roll-over” on Sunday. The part-timers host Denis Betts’ side - under pressure after finishing bottom of the pile among the elite - in the second round of Qualifiers this weekend. Widnes started out with a 28-14 home defeat to Super League rivals Warrington Wolves last week and are seen as arguably the most vulnerable top-flight side. Gutsy Halifax, meanwhile, began by almost causing a shock when leading at Championship leaders Hull KR heading into the last eight minutes only to then cruelly lose out 26-22. Some will think it will be difficult for Marshall’s side to back-up that effort and they may be ripe for picking at The Shay. But Widnes, especially on home turf, is a fixture they have always felt could earn them a scalp. “We want to aim to prepare and to win every game but we’re back at home now and our last home game against Hull KR was outstanding,” said Marshall, referring to the regular campaign defeat of Rovers that secured their top-four place. “We blew Hull KR away that day and it didn’t take too much out of us. “We trained Tuesday night and trained really well while we’ve another two sessions to go before Widnes and we go in confident. “We won’t relax, or feel hard done to about what happened last week, or roll over for a Super League team. “We intend to make it really hard for Widnes to break us down and win the game. They played Widnes at home in the Middle Eights two years ago and lost out just 14-0 following a fine showing but they will hope to improve on that this time around. Fax could so easily be going in with a win already under their belt, too, after an excellent performance at KCOM Craven Park last Sunday. 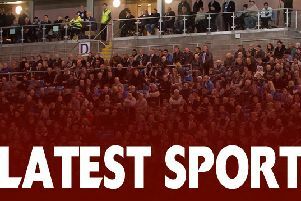 Winger Ben Heaton scored four tries as they overcame an early 8-0 deficit to lead 22-14 in the final quarter only to eventually lose out to Nick Scruton’s 72nd minute try. Marshall conceded: “We felt we were a bit unlucky not to win and we did feel we were the better side. “Aside from 10 minutes at the start and 10 minutes at the end, I thought we controlled the game really, really well. “A couple of calls went against us and we conceded a couple of scruffy tries by our standards. “But we scored some wonderful points to get ourselves back in. They will be without suspended Ryan Boyle for the Widnes clash. The ex-Castleford prop was handed a one-game ban after submitting an early guilty plea to a Grade B dangerous contact offence on Hull KR’s Mose Masoe. “There was no malice or intent there - Boyley’s not that sort of player at all - but he just got himself in a poor position,” explained Marshall, with regards the ‘chicken wing’ tackle that went on report. “We’ve no qualms and he probably deserved a one-game ban. “Jacob Fairbank could maybe come back in after his broken hand. “I don’t think he’ll be 100 per cent but he is an option to us.